Here in the UK, this Sunday is Mother’s Day. Traditionally, it’s a day when supermarkets and gift shops stock things covered in flowers or coloured pink, emblazoned with the word MUM. Now, I’m all for showing someone that you care. But my point is that mums are amazing all year round. Mothers loom large in all my stories. They’re not always present or especially maternal, but they have a huge impact on their daughters. Ma in ‘Frost Hollow Hall’ is a very cool customer, and Louie’s mother in ‘The Girl Who Walked On Air’ abandons her as a baby. In ‘In Darkling Wood’, Alice’s mum doesn’t always cope, whereas Florence’s mother is traditional and rather proper. None of these mums gets it right all the time. So obviously I’ve got massive mother issues of my own, yes? What I can say is I know how important a mother is to her daughter. 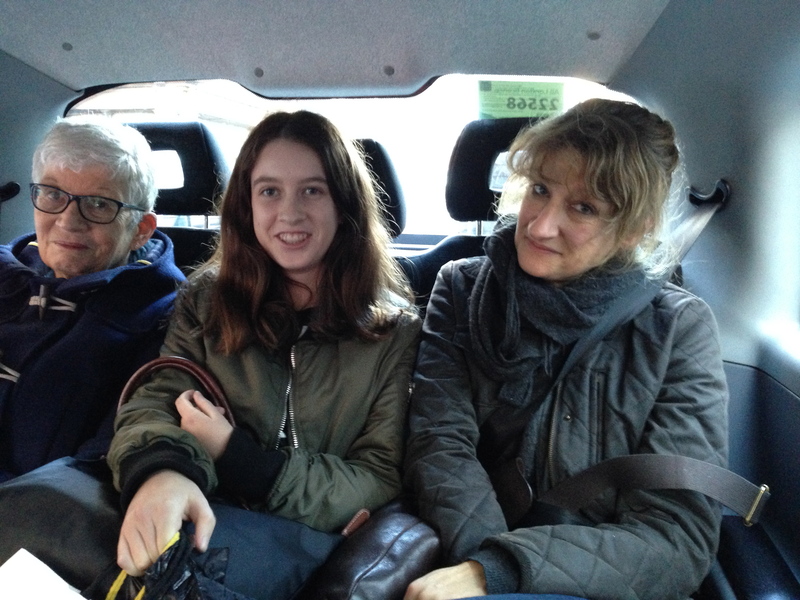 Taken in January this year, the picture below shows (from left to right) my mum, my niece Eliza and me, all squidged together in a London cab. My niece was visiting from Australia. Miles from home and missing her own mum, we took her on a shopping trip to The Big City. You’ll notice how Eliza is the only one smiling. Whilst we were there, I got sick with flu. So, once I’d been unceremoniously dumped in the Waterstones Piccadilly cafe, my mum and Eliza trawled Oxford Street. For hours. And hours. It wasn’t until later when we caught our train home that my mum collapsed in her seat in agony. She’d hurt her back BEFORE we’d even come to London, but not told us because she ‘didn’t want to spoil the trip.’ Typical Mum. She’s only just finished treatment for it now. This is one example out of millions. My mum is gloriously, stupidly selfless. She’s always like it. Always has been. Always will be. If your mum’s anything like mine you’ll know mums aren’t just mums for the day. Quite frankly, Mothers Day- or a naff present- doesn’t do them justice.